How can a successful cross border planning process be organised in view of differing institutional responsibilities and governance levels? How can different maritime interests and conflicts be addressed through MSP? What are the lessons and recommendations for undertaking effective cross border MSP? The BaltSeaPlan project accompanied the EU Maritime Policy by supporting the introduction of Integrated Maritime Spatial Planning and preparation of National Maritime Strategies within Baltic Sea Region. 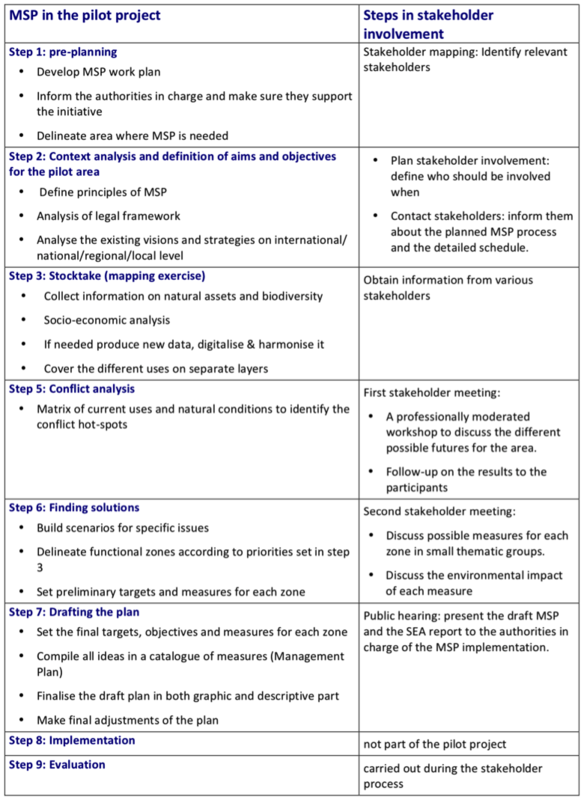 The pilot plan was an informal process which was started before the adoption of the MSP Directive. However, lessons from the project and pilot plan informed the drafting of the MSP Directive and other MSP in the Baltic Sea Region. It also contributed to the implementation of the HELCOM recommendation on broad-scale Maritime Spatial Planning and the VASAB Gdańsk Declaration. 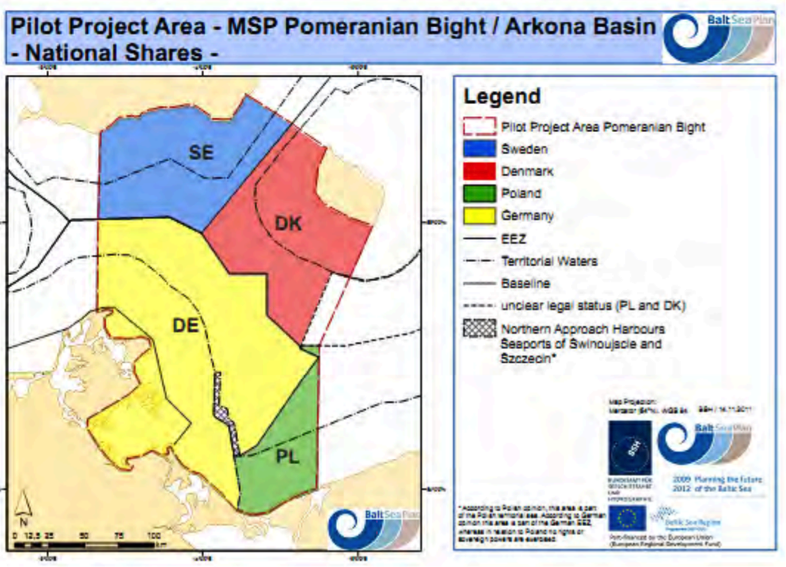 The planning process in the Pomeranian Bight and Arkona Basin started with a level playing field and took a fresh look at the issues to be resolved and possible solutions without being constrained by existing plans. Delineating the exact extent of the pilot area was a key task at the beginning of the pilot project. The area comprises of the territorial seas and respective EEZs of Denmark, Sweden, Poland and Germany. There were contradicting legal opinions between Germany and Poland concerning the area of the northern approaches. The border region between Denmark and Poland also had unclear legal status. These areas were marked as a disputed area and as marked out for further discussion at the high level decision making. The natural and the socio-economic condition of the pilot area was analysed although a full SEA was not undertaken. This included information and data on sea bed morphology and bathymetry, salinity, ice conditions, wind conditions, as well as natural assets such as sea birds, fish and harbour porpoise. This was complemented by a description of demographic trends, the economic situation in the respective coastal regions, international legislation affecting the pilot area, and the existing spatial planning framework and policies in the respective countries. A comprehensive stocktake of current uses together with a brief overview of the trends and developments expected in these. 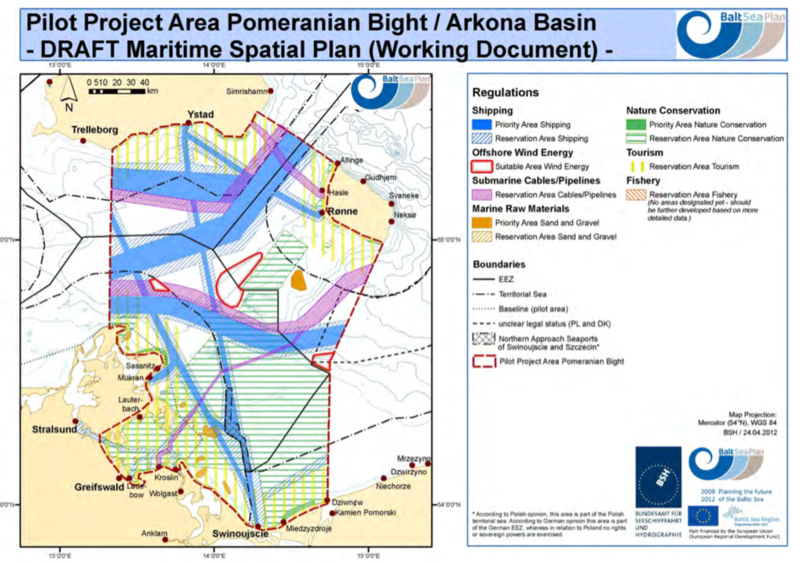 This focused on transnational uses that extended across the entire pilot area and included shipping, nature conservation, offshore wind farming, tourism, fisheries, and sand and gravel extraction. Based on the stocktaking maps, conflicts were identified by the planning team. The stocktaking maps and conflicts were further discussed and refined with stakeholders. Methods such as the conflict matrix were used to identify and analyse conflicts (see example below). Marxan software was successfully applied to identify potentially suitable areas for offshore wind farming and fishery zones, providing a range of scenarios that can now be further discussed and fed into the decision-making process. Priority areas: no use is allowed that would significantly constrain the use that is given priority in this area. Reservation areas: a certain use is given special weight in the process of balancing the competing interests in the area. The difference to priority areas is that it is not certain that the use receiving specific attention has absolute priority. Suitable areas: an activity is exclusively assigned to respective suitable areas which have been chosen along a range of parameters – outside of these areas the activity is not allowed and not licensable. Open use areas: no use has priority and all uses other than those restricted to suitable areas are allowed. 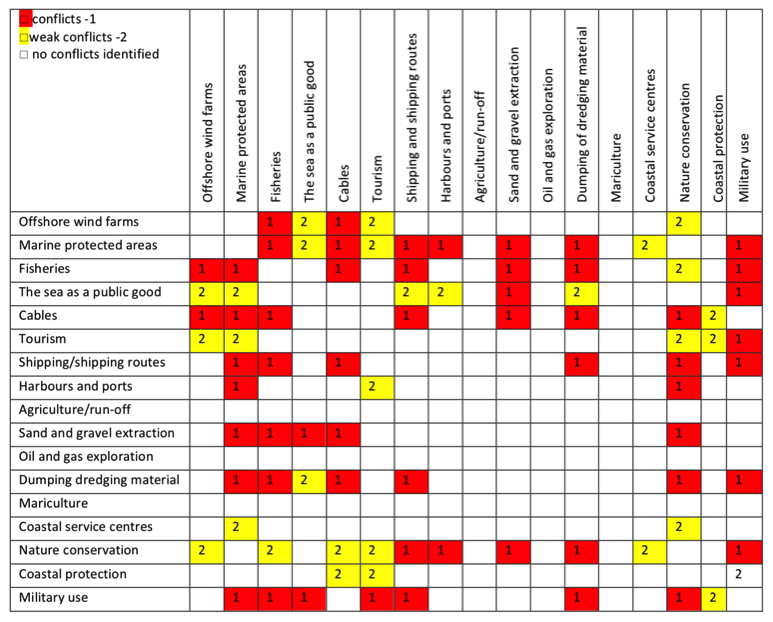 The planning process also identified issues and recommended planning approach for each of the sectors that were analysed. Since this was one of the first practical cross border processes in the Baltic Sea, it identified practical challenges and lessons from the planning and stakeholder process. Recommendations for implementing MSP included those targeting the organisation, planning process and the various achievement of the pilot project. The key lessons and recommendation developed considered issues that should be considered in other transnational MSP processes based on technical aspects, stakeholder involvement, necessary resources and working as a team during the planning process.